M&N Heating & Plumbing joined in with the World's Biggest Coffee Morning, hosting our own event to raise funds for Macmillan Cancer Support. Many M&N staff members have benefitted from the wonderful care and support that Macmillan offer, and we're happy to support the World's Biggest Coffee Morning as it's a cause close to our hearts. We were joined in support by Tibbetts Group Company, who are also on the Vantage Business Park. 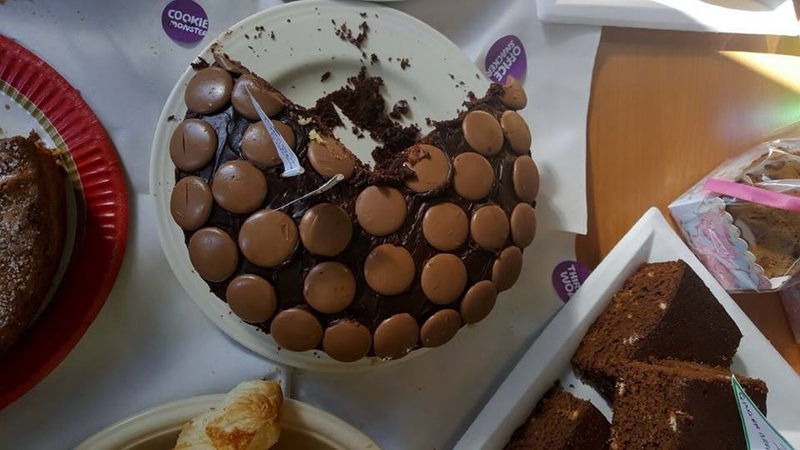 Staff, suppliers and customers joined us for cake and fundraising activities, including several fundraising competitions such as Lucky Square, Spot the Cake and Best Baked Cake! For those without a sweet tooth, we offered savoury options including bacon rolls, sausage rolls, scones and cheese twists. In conjunction with Tibbetts Group Company, we ran a competition where people voted for their favourite cake. The top 5 cakes voted entered a social media voting competitiong on our Facebook page to decide the Best Baked Cake! Cakes were selling for £1.50 a slice. The following cakes reached the final vote and Facebook users had the opportunity to Like their favourite over the weekend with the voting closing at 12pm on Monday 3rd October. With 12 Facebook likes, the Devil's Chocolate Cake won the Best Baked Cake Competition, with Abbie winning the bottle of bubbly - congratulations Abbie! In total we raised £741 for Macmillan Cancer Support, exceeding last year's total of £732 - thank you for all your support! Check out Macmillan's latest TV advert below and, to find out more, visit the Macmillan Cancer Support website.